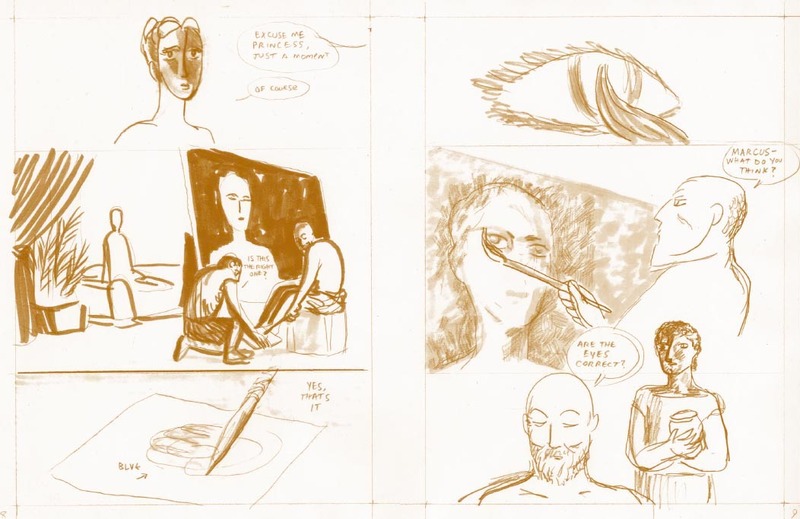 Frank Santoro is an artist with a vision that can run counter to what some people expect in their comics. Casual, and more refined, readers alike tend to want their comics ink-rendered, bold, and grounded in a certain manner. Santoro’s work is often pencilled and it is experimental and has an ethereal quality. But a reader only needs to take a careful read to see that Santoro’s work has its own unique substance. 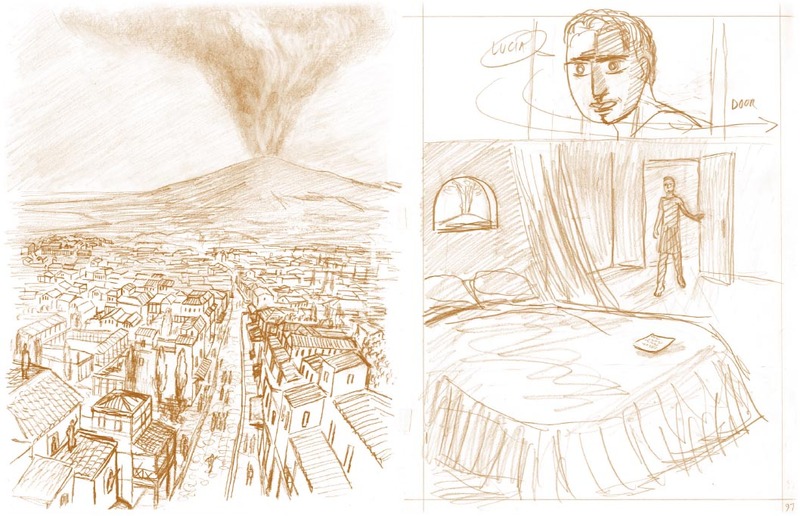 In “Pompeii,” his most recent graphic novel, published by PictureBox, Santoro maintains the spontaneity of sketchbook drawings in a well orchestrated narrative. This is a story about learning how to see the world as it really is and perhaps gaining solace from how it may have been. The story itself is elegantly simple. There’s no apparent mystery to solve. That’s not to say it’s not interesting. In fact, it’s a fascinating look at some banal moments before the eruption of Mount Vesuvius in the year 79 AD. This led to many of the inhabitants of the harbor town of Pompeii to be suffocated, and preserved, by volcanic ash. The sense of mystery is mostly coming from the artwork. Santoro was once an assistant to the artist, Francesco Clemente. That influence is present in Santoro’s attitude. It amounts to a fine interplay of understatement. There’s Marcus, a callow youth, who fades in and out. And there’s Flavius, arrogant and conniving, also fading in and out. Marcus finds Flavius to be a total jerk but he hopes to learn much as an assistant to the great artist. Both characters are pompous fools and both are ultimately little more than fleeting images. Marcus is learning the ways of the world in a world already doomed. Considering the monumental event that is inevitable, the ghostly quality to the drawing and the steady pace and low-key structure provide a satisfying sense of irony. Artist and assistant toil away to maintain a sense of order. Little do they know what lies ahead. Little do they realize how futile their efforts are. They can’t even keep their own personal lives in order. But try they must. We feel that force of will on each page with a steady grid of divided panels that evoke the precision and balance of the golden mean. One narrow panel banner followed by a panel banner twice as high, followed by another narrow panel banner. And so on with some variations. Each character’s face and body pushes and pulls its way through this ongoing canvas, variably depicted in gestural marks, outlines, and more built-up work. It is not necessary that Santoro be an exceptional draftsman or storyteller. In many respects, he is striking a certain mood and sustaining a certain view. He has the insight to achieve this. Santoro even includes notes as if providing stage direction. Some may find this to be artistic posturing. Others may be too easily enthralled. It certainly does not come across as mere storyboarding. It does feel like art. In truth, Santoro has tapped into something that is natural for him. That’s what it looks like. And that’s a great attitude to bring to working in the comics medium. 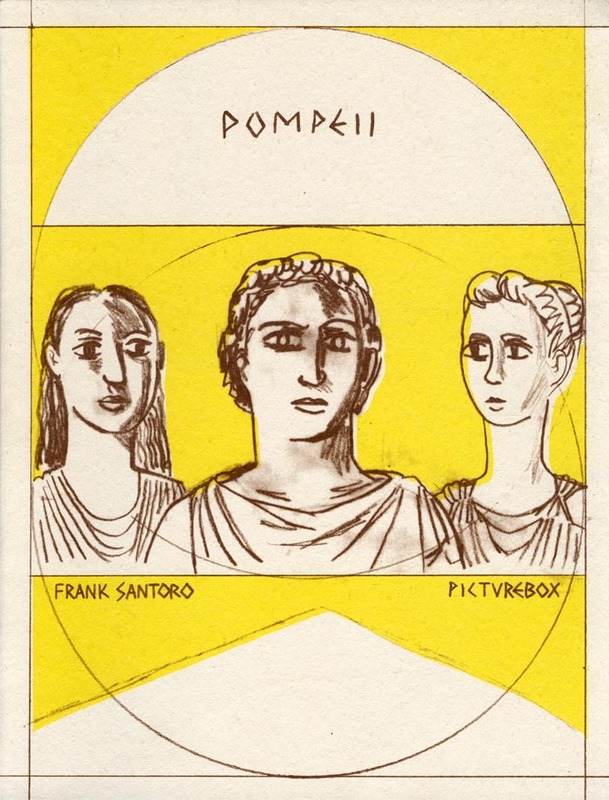 “Pompeii” is a 144-page, 8.5″ x 11″ trade, priced at $19.95, sepia tone. You can find it at the PictureBox website here.